The Dark Avenger proves that crime does not pay in classic pulp novels by Walter B. Gibson and Bruce Elliott writing as "Maxwell Grant." First, a huge investment in a South American country attracts international criminals and corrupt politicians, leading the Dark Avenger on a hunt for "Shadowed Millions." 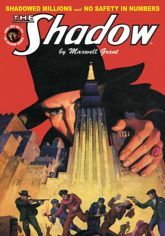 Then, gang violence and gambling madness corrupt a city until The Shadow demonstrates to vicious mobsters that there is "No Safety in Numbers." BONUS: "The Chateau of Shadows," a Golden Age of Comics classic by Walter Gibson and Bob Powell. This instant collector's item showcases the original color pulp covers by George Rozen and Charles J. Ravel, the classic interior illustrations by Tom Lovell and Bob Powell, and historical commentary by Will Murray and Anthony Tollin.